How is it possible to believe so passionately in something so blatantly wrong? It’s not an intellectual thing. It’s just not a habit I ever formed so even when there is a TV around, it never occurs to me to turn it on. That means that when I do watch TV, I watch other people’s choices. Man… do you learn a lot about your friends by how quickly they reach for the remote, what the tune into, how they engage with content. It’s an amazing source of sociological insight. It also means that occasionally you will discover amazing gems of great beauty and great randomness without needing to lift a finger. It was under exactly those circumstances (someone else in charge of the remote) that I ended up watching a documentary on Flat Earthers. They don’t let science stand in the way of a good story. They think you are a snob and I dread to think what they would think of me. Seriously though. The documentary was mind blowing. Thousands upon thousands of otherwise normal-seeming folk believe in something that is conclusively scientifically proven to be incorrect, not least by their own experiments. No matter. They are convinced, we all live under a dome, Truman Show style. What’s outside the dome? Who made the dome? Who pays the electricity bills to the biggest LED display on earth? I have so many questions. The main one of which was: “how is it possible to believe so passionately in something so blatantly wrong?”. Strong convictions loosely held is not just a clever turn of phrase. It is also an accurate description of the mechanics of holding on to strong convictions in the face of evidence that challenges and disproves them. A bit of slack in the rope. A bit of room in the definitions. A bit of lenience in interpreting some of the data. A bit of self delusion and ta-dah, you are ten years and hundreds of billions of dollars into a transformation journey that proves beyond the shadow of a doubt that emergent technology has emerged, that it is real, robust and scalable and that it will lead to a transformation of your business model whether you like it or not. And yet we still try to hold on to old shapes on new rails like the evidence isn’t there, isn’t enough yet, isn’t quite compelling. That’s not what I was talking about, was it. 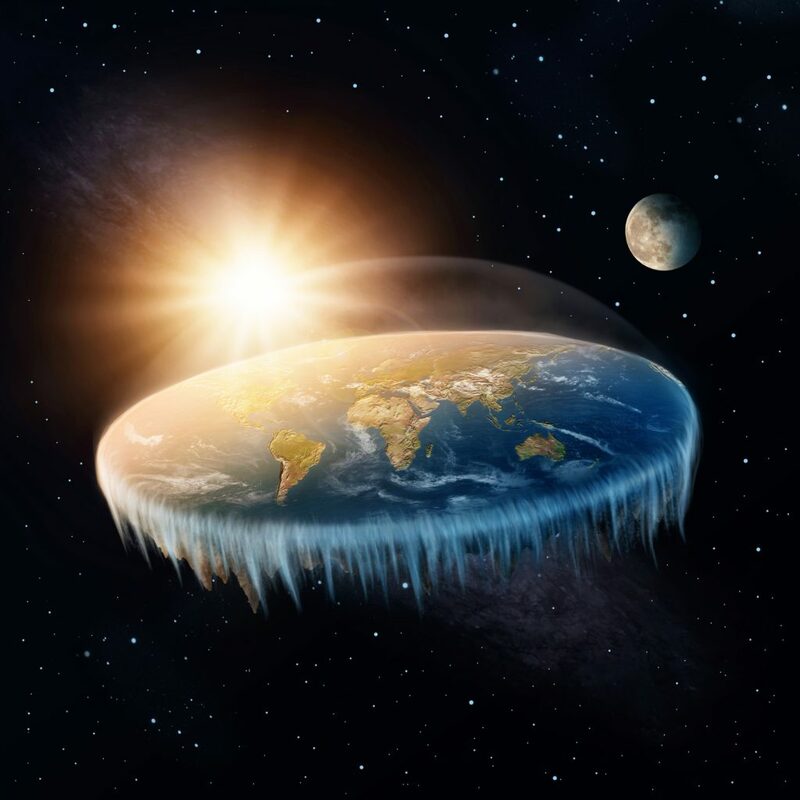 The whole flat earth thing was funny until the person I was watching it with said “let’s see you connect this to fintech for a #LedaWrites” – challenge accepted. And then my heart sank because it was really not that hard. Not the Truman Show stuff and the giant dome madness but the mechanics of absolutely, resolutely and consistently refusing to accept scientifically and systematically procured evidence as adequate. The mechanics of moving the goalposts to avoid accepting that something we don’t much like is still true. The mechanics of starting from the things we wish were true and running experiments to support them and disprove the alternative and then running more experiments if we don’t like the outcome. Asking for business cases and proof points and hard commitments for the things we wish were not true. And raising the bar of expectation in the name or risk or compliance when the proof points are found. Can’t be too careful. Putting it on other people to convince us of what is blatantly true, because we hold the purse string. It was way too easy. And depressing. The truth doesn’t need you. Nor will it set you free. We have been on this transformation road for most of my career. Time, money and talent has been wantonly wasted because people in positions of power chose what to believe in and set the tone of every conversation. For any big corporate, the truth is what the annual report and the shareholder meetings work to. And if you disagree with that, I want to know what bank you work in, because it’s special. We laugh now, but about 15 years ago I used to fight with my corporate overlords about open source. It was not safe. It was not professional. It was not for us. Then it was APIs. Or was that before? Then it was real time risk modelling. The pattern is the same. No matter what science and technology prove to be true, if it goes against the grain it will be mocked and challenged. Now. There is nothing wrong with experimentation and testing. It is actually absolutely essential to both science and good governance that proof is sought. That tests are ran and tires kicked. It is responsible to be thorough before new technology is used to service your mortgage or pension. You don’t want that stuff to go wrong. What is not ok, is to have the tests seeking a reason to say no to the real conversation being had: will the things that made me MD keep me here in the new world? (No). Will the things that made us money continue to do so in the new world? (Not in the same way). Will I need to change my systems, my organisation, my ways of working and my team to be in tune with what science and technology have made possible outside the bank, with what is already real in all other aspects or life and some of my new fangled competitors? (Yes). When put that way it is no surprise that people won’t go down without a fight. But the reality is these folks are not prepared to acknowledge they are wrong. The proof points are only accepted if they are aligned with hope and personal interest. The fight is not about the truth or the proof, it is about survival of a particular shape of the world. I almost admire the tenacity. But the amazing thing about scientific fact, technology and the market is that things don’t need you to believe in them to be true or come to pass. You can choose to disbelieve what is true. It will stay true. You can silence and discredit it for a time. And that time may be a long one. I am hearing echoes of Galileo whispering “e pur si muove” through the ages: still it moves, whether you believe it or not. And it is most definitely not flat, whether you like it or not. And the way you used to make money and feel important will change, whether you believe, accept or encourage it. You have two choices: change with the world or barricade against it alongside like-minded folk who will pat you on the back, point to things that reassure and comfort and help you waste time but not lose sleep. There is some comfort in all this even if there is no sense. You never know, one day I may find myself watching a documentary about you. The last of the old school bankers: an exercise in faith and futility. If Earth is approximately spherical, then spherical geometry should substantiate that claim. A sphere with a diameter of 7917.5 miles, and circumference of just under 25,000 miles, will curve at a rate of 7.98 inches for every mile squared. If Earth is approximately spherical, the alleged curve will be measurable, repeatedly, over every large body of water, as water always seeks its level. That is not at all what we are observing and measuring……..anywhere. In fact, objects in the distance which should be obscured by hundreds of feet, and sometimes miles, of curvature, are proving to be in direct line of sight. It’s that “plane” and simple. Agree, when science is imperfect you have to question the results and also the vested interests who fund these studies. Hi Lynn, watch a sail boat go out to sea, the hull disappears first and the mast last. The Earth isn’t actually a sphere. It’s pushed down on the top and bottom and flabby in the middle because of the spin of the Earth. Also, there are many very tall mountainous areas and many deep crevasses. The Earth is a geoid: a very inconsistent shape.